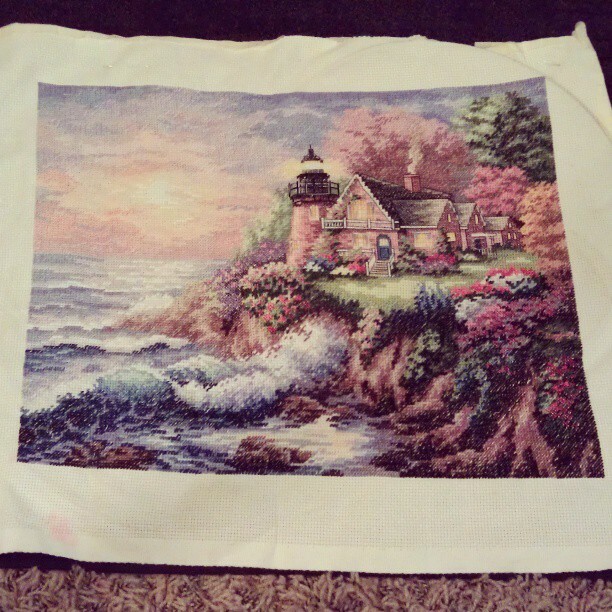 OK, I stitched this so many times that I started to memorize the chart towards the end. The card itself isn’t anything spectacular — I just made the design from various symbols from Bungie’s Destiny, but the reaction of the people who I sent these to? It was absolutely awesome. Let’s be honest, it wasn’t about the card soldiers. Or the rose topiary. It was about that epic card display. I love, love, love it. The only downside is that gravity is a worthy opponent and it was pretty much ruined within a day or two, but for that 24-36 hours, it looked downright Wonderlandian. Yes, he’s from a video game that is slated to be out in 2015. Still, the adorable dude demanded to be cross-stitched. I finished him in record time (less than a month) and proved to myself that my cross-stitching program isn’t necessarily to be trusted in discerning colors (which would have been nice to know before I started the Destiny cross-stitch). I made this for my sister and brother-in-law’s wedding. They like all things geeky (They had a Legend of Zelda themed wedding.) and I knew I had to whip up something awesome for them. There’s not much to talk about with this one. I made it for my grandparents’ birthday and it looked absolutely beautiful. I love the Gold Collection series and this finished cross-stitch shows exactly why.